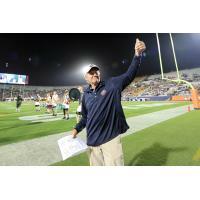 The Alliance of American Football kicked off its inaugural season Saturday night with a pair of games. The Orlando Apollos overwhelmed the Atlanta Legends, 40-6, in the rain at Orlando. 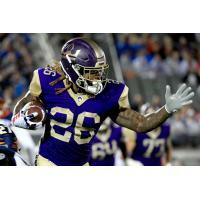 Orlando's offense stole the show as the Apollos dominated the first half against visiting Atlanta to take a 22-6 lead into the locker room. Trailing 16-6 with under a minute left in the first half, Legends coach Kevin Coyle gambled by going for it on fourth and one in his own territory with under a minute left. The move backfired when the Apollos stopped them and then scored on a Steve Spurrier special right before the half to take a commanding lead. Orlando quarterback Garrett Gilbert caught the late first-half score on a pass from Jalin Marshall. Gilbert also threw for the first touchdown in AAF history to Marshall earlier in the game. Gilbert completed 15 of 25 throws for 227 yards and a pair of scores. The San Antonio Commanders wore down the visiting San Diego Fleet, 15-6, in front of 27,857 at the Alamodome. San Antonio's defense intercepted three passes and harassed Fleet passers with six sacks on the night. Starting field position hampered both offenses in the first half as two offensive drives began at the seven-yard line and another at the five. Interceptions set up a field goal for each team in a 6-6 first half. After a scoreless third period, San Antonio cracked the end-zone on the first play of the fourth quarter on a three-yard run by Kenneth Farrow II to provide the winning margin. Nick Rose connected on three field goals, the final with 3:34 remaining. For San Diego, Philip Nelson replaced Mike Bercovici behind center in the third period, but didn't fare much better against the stifling Commanders defense.